Wildfire Cutlery Price List - custom work not shown in price list quoted quickly and competitively. Price List for my hand made carbon steel kitchen knives w/o any handle add-on’s. These prices listed below, cover my basic kitchen knife: carbon steel blade with in shop local hardwood handle and brass bolsters custom made for you. As seen in photos below. using O-1 tool steel 5/64″ or 3/32″ thick – your choice. 12″ made from 3/32nd inch thick 1095 tool steel. 4” long blade. 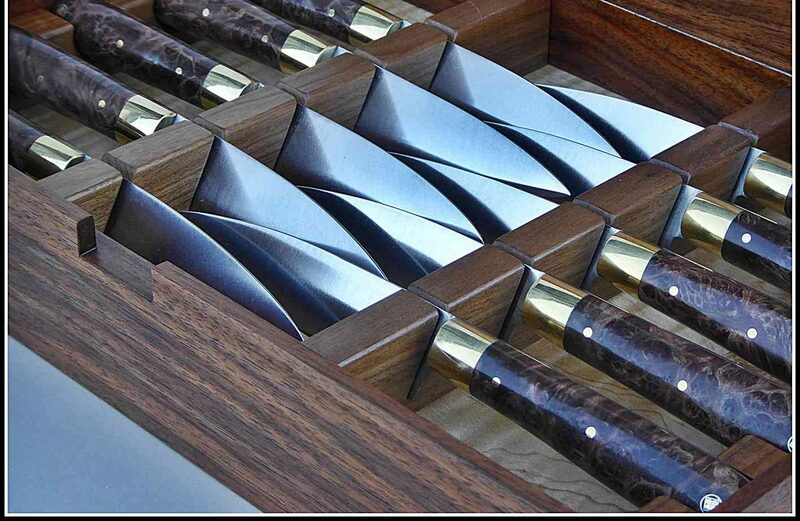 Can be made 5″ blades, also. Each 1″ x 4″ kitchen knife is $89.00 usd, retail. Each 1″ x 5″ kitchen knife is $106.00 usd, retail. made with 3/32″ 1095 tool steel.